Three is a Magic Number ~ The Bucky Channel - The World of Sports from Wisconsin's Perspective. Simply put, the Bucks did work on the Hawks in game three at the Bradley Center. They finally played Bucks basketball Saturday night to get a much needed win in their series against the Atlanta Hawks, and this series is still in reach if they can play well Monday night. They had been coming out flat early in the first two games, but Saturday night they decided to set the tone right away. 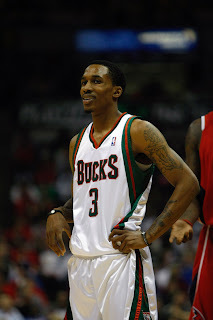 Brandon Jennings played a huge role in that, because he made three tray balls in the first quarter. John Salmons also started making his turn around jumper again to get the Bucks out to a 36-19 lead after one. The Bucks didn't shoot well at all in the second quarter, but they played great defense to keep a lead. This was the first time in the series that the Bucks seemed to be challenging Hawk shots. They also limited the offensive rebounds Saturday night. The Hawks love to do two things, run the fast break also get offense rebounds, and it was good to see the Bucks hold strong. The Bucks only scored 16 points in the second quarter, but still had a 52-40 lead at halftime. Milwaukee used the tray ball in the third quarter to continue to build up the lead. Milwaukee was 4-8 from downtown in the third quarter. Carlos Delfino, who was cold in the first half, made two huge threes that really got this team going. He also gave the fans something to get loud about, which they did very well. I have to say that the "Red Out" failed, but Squad 6 together with all the other fans were very loud. They really played a role in being the sixth man for the Bucks Saturday. You could definitely see the crowd having a positive affect on the Bucks too. With 1:36 left in the third quarter Jennings stole the ball from Mike Bibby. He was going to go for a lay up when he decided at the last second that he would pass it behind his back to Stackhouse for the slam. This really gave the Bucks everything they needed to put the Hawks away for good. The fourth quarter was just an offensive bench scoring fest. This gave the starters a chance to sit and enjoy the a good view from the bench. Also a few of the bench players were making sweet plays which led to Jennings and the crew to be dancing on the sideline. Andrew Bogut was also getting in on Squad 6 chants. If this isn't a TEAM I don't know what is. They don't do anything over the top to offend the other team, but they do have fun. Lets check out some highlights from the 107-89 beat down the Bucks put on the Hawks. * Brandon Jennings and John Salmons must lead this team with Bogut out. That is what they did Saturday night. Combined they finished 35 points, 12 assists, and 4 steals. If these two can play well everyone else seems to play better too. * All five Bucks starters were plus in the +/- category. That is never a bad thing when your starters are on the court being productive. * The Bucks held the Hawks to 13 fast break points. That is something the Hawks can hurt other teams with when they turn turnovers into points. The Bucks were a little careless with the ball at times, but did a good job of keeping those fast break points down. * Both teams had five blocks. In the first two games it seemed that the Bucks were getting blocked every shot. Milwaukee seemed to go to the hole stronger Saturday night. * The Bucks got the line 16 times which is not a huge number, but when you make 15 of those shots that is huge. That means when they got to the line they took advantage of it. * Every Buck that got into the game scored except Charlie Bell. Ha, go figure. Charlie Bell playing well is like saying Jeff Suppan is going to pitch a gem. * Josh Smith made fun of Milwaukee, well at least the night life. Now he is not someone that I'm going to praise on this site anymore. Way to go Smith. I really liked you too, until you went all Agent 0 on Milwaukee. The Bucks are back at it Monday night in the Bradley Center. The boss of the Bucky Channel and former writer Bear are going to the game. They are both undefeated going to Bucks games this year so lets hope they can keep it up. Tip is 7:30 Central time, and the game will only be on FSN unless you do have NBA TV. The Bucks need to tie this series up at two, and this will be a series again. With the way they played on Saturday, I think they might be able to do it. But cant you feel this magic in the air?